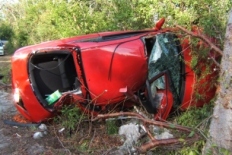 (CNS): A single vehicle car crash on Cayman Brac early this morning left one man hospitalised. Unofficial sources say the 29-year-old driver of a red Honda Integra Type-R, who was the only person in the car at the time, collided with a tree on Rock Road between 1:00 and 1:30am today, Thursday 11 February, and sustained multiple injuries. He was taken to Faith Hospital, where apparently he is in stable condition. Anyone with information about the incident should contact PC Melbourne at Cayman Brac Police at 948-0331 or 926-0635. Slow Down……Where in the world are you in a rush to go? Cayman Brac is very small and not as congested as G.Cayman where you have to leave an hour before the actual time. Hope you will get better soon and at the same time grow up!!!! Good ting Cayman Brac small…imagine if they had roads and places to go- wouldn’t be anyone left da!!! Una slow down! !